Looking for More on the Supreme Court amicus brief? It’s here (and we apologize for the extra click). 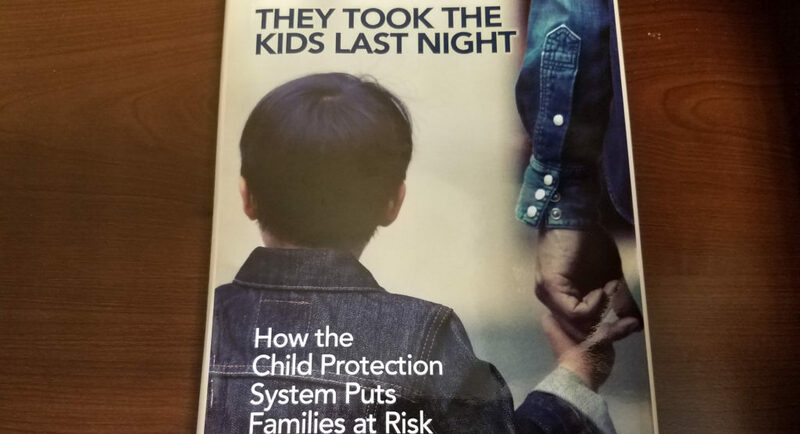 Published in late 2018, Diane Redleaf’s They Took the Kids Last Night: How the Child Protection System Puts Families at Risk is an excellent read. Redleaf, who works with our lobbying arm in the United Family Advocates coalition, expertly balances personal stories with legal facts to provide not only a must-read, but a page-turner as well. That is a rare combination in this kind of exposé. For most of the book, the author follows the account of Lynn and Ben, a professional Chicago-area couple falsely accused of abusing their infant son. She reveals the distrust and presumed guilt they found in the family court system. Secrets were kept, policies were violated, and parental rights were trampled, while an innocent family paid the cost. She provides a catalog of ways “the System” of child welfare injures families and robs children of the security of their own parents. But she presents it in the context of Lynn and Ben’s (and other families’) experiences. In doing so, she simultaneously tells a compelling story while providing the reader with a mass of beneficial information. Redleaf’s work teaches on the secrecy of child safety plans, the abuse of “emergency removal orders,” the difficulties posed by “child abuse registries,” and the danger of (and circular reasoning behind) “child abuse pediatrics.” As she does, her 30 years of experience are on full display. So is her deserved contempt for the broken system. In the interest of full disclosure, I mention again that I work with Diane Redleaf on a bipartisan coalition to affect child welfare and family rights reform at the federal level. But my reason for endorsing this book is not that I know Diane. On the contrary, I am all the more grateful to know Diane after having read this book. As the founder and original legal director for the Family Defense Center in Chicago, Diane has spent her time in the trenches. She knows what families go through whose children are taken away (or who are threatened with removal). She was there, and not only stood up for but sat down beside these families as they faced their worst nightmare. In They Took the Kids Last Night, she shares the accounts of twelve innocent parents—six innocent families—and all they went through to keep their children. And she knows the situation is even worse for those without the opportunity or resources to access the kind of legal help she can provide. “[A]t the time most children are seized, very few of the parents have access to legal counsel to explain what to expect at the end of the 48-hour mark. Few families have anyone gathering evidence and preparing arguments on their behalf for the first scheduled court date. Most parents in the juvenile court are indigent, and even those who are not indigent likely have difficulty finding a knowledgeable and experienced lawyer to help them within the short time before the first court date,” she writes. Her accounts in the book show what a difference that kind of counsel can make. But it often makes a difference largely because the deck has been inappropriately stacked against any family in the system—even the many who are innocent. The chief take-away from this book matches the conclusions we’ve reached based on our own studies of the research: our current system of child welfare is unconscionably flawed. Innocent families are suffering trauma at the hands of the very agencies intended to rescue children from trauma. What I have seen in the numbers, Diane has seen in person. In this book she expertly captures mental photos of what that looks like and shares them with us as we read. As a result, the reader is left with the inescapable conviction that the situation is untenable. Change must come soon. As a result, Redleaf’s work is a worthy resource for families going through child welfare intrusions, and for the lawyers, doctors, and counselors who would advocate for them. Further, it is food for thought for anyone concerned with family rights issues such as ours.